Janet Cardiff and George Bures Millers Thought Experiments in F# Minor. LOS ANGELES, CA.- The Los Angeles Philharmonic announced today that a Centennial commissioned work by renowned artists Janet Cardiff and George Bures Miller, entitled Thought Experiments in F# Minor (a free augmented reality walking tour of Walt Disney Concert Hall), will become available to the public beginning March 1, 2019. 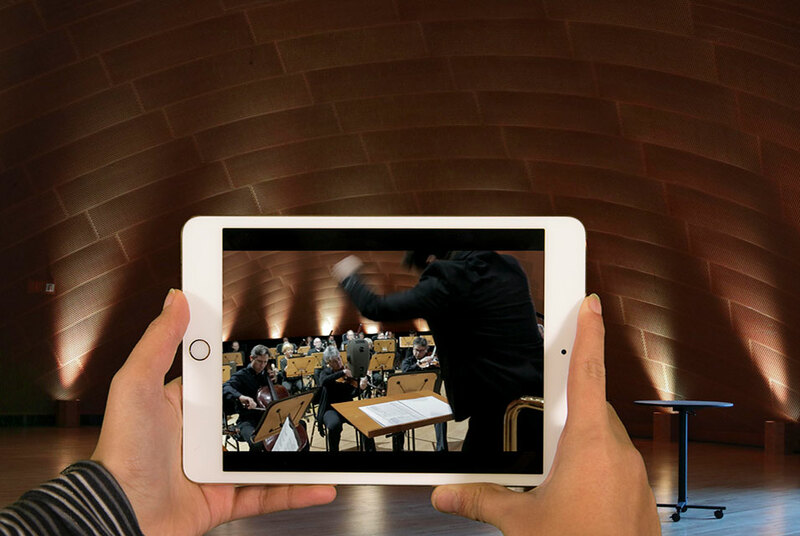 Accessed on iPad Minis and headphones and featuring LA Phil musicians, the Cardiff and Miller artwork takes visitors on a dreamlike trip through the spaces of WDCH, revealing an otherwise invisible world complete with a hypnotic 3D sound environment. Thought Experiments in F# Minor features original music by Ellen Reid. Yuval Sharon, currently in residence as Artist-Collaborator of the LA Phil, served as curator for the work. The 40-minute artwork will be offered during the same hours as the Music Centers self-guided audio tour of WDCH, from 10 am to 2 pm on most days. Janet Cardiff and George Bures Miller are known for their immersive multimedia sound installations and audio and video walks. They have recently shown at the Museum of Contemporary Art in Monterrey, Mexico (2019); Oude Kerk, Amsterdam (2018); 21st Century Museum of Contemporary Art, Kanazawa, Japan (2017); Fondation Louis Vuitton, Paris (2017); ARoS Aarhus Art Museum, Denmark (2015); Museo Nacional Centro de Arte Reina Sofía, Madrid (2015); Menil Collection, Houston (2015); 19th Biennale of Sydney (2014); the Cloisters, Metropolitan Museum of Art, New York (2013); and Documenta 13, Kassel, Germany (2012). In 2011 they received Germanys Käthe Kollwitz Prize, and in 2001, they represented Canada at the 49th Venice Biennale, for which they received the Premio Speciale and the Benesse Prize. Janet and George live and work in British Columbia, Canada.